Do you need extra help for EL students? Try the Five Senses Mystery BagsPre-lesson. Students will be able to use invented spelling to write a spring-themed poem using their five senses. Ask students to share what they know about their five senses. Support students to understand that the Five sensesAre what we use to explore and interact with the world. They include touch, taste, smell, hearing, and sight. Tell students that the body parts that enable us to experience these senses are our skin, tongue, nose, ears, and eyes. Tell students to close their eyes. Describe for students a beautiful spring day. Use descriptive language to invoke your students' five senses. For example, describe the feeling of bare feet on the field wet with rain, the sweet smell of flowers, the sounds of birds chirping, the taste of sweet honey, and the sight of the sun shining on the puddles. Ask students to open their eyes and use their five senses to describe what a spring day is like. Explain to students that today they are going to write a poem about spring using their five senses. Beginning:Preview the lesson by reading aloud a short book about the five senses, such as My Five SensesBy Aliki. Intermediate:Use visual aides such as pictures or physical objects to demonstrate how to describe something using the five senses. Post a piece of chart paper on the board with five headings: see, smell, taste, hear, and feel. (Tip: Include a body part picture next to each of the senses for those students who cannot read yet). Ask students to take some time to think about the different things that they see, smell, taste, hear, and feel during the spring. Tell students to turn to a neighbour to share their ideas. Call on student volunteers to help you fill in this chart. Use a combination of words and pictures to support all learners. Beginning:Review the four seasons and check that all students have a shared understanding of what might be seen touched, tasted, heard, or smelled during the springtime. Project the Wake Up Senses worksheet onto the board. 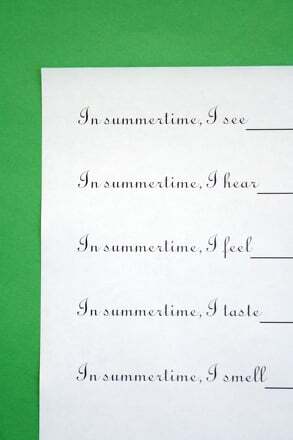 Tell students that they will be using this worksheet to create their spring senses poem. 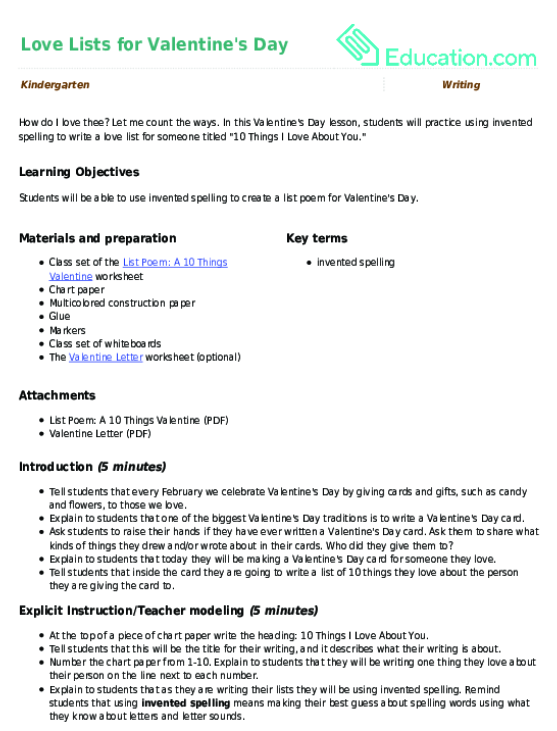 Model for students how to use invented spelling to write the topic for the poem Spring. Explain to students that next they will be filling in the blanks next to each of the senses. Call on a volunteer to come up to the projector to share one of their ideas for something they see during spring. Support the students use of invented spelling by helping them stretch their words out, isolate sounds, and write the sounds they hear on the worksheet. Tell the volunteer to also include a picture of what they see during spring. Have students share the pen by calling on another volunteer to come up and fill in the next space with a word and a picture. Continue this process until all of the lines and boxes have been filled in. 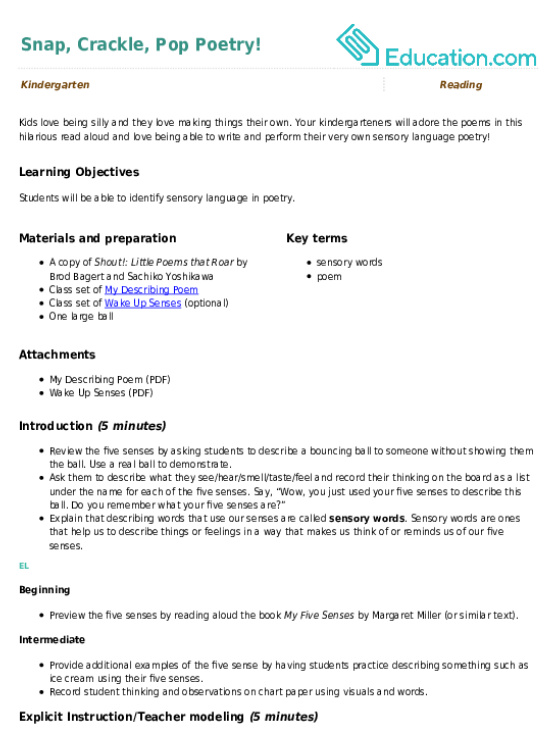 Review or explain what a poem is by reading aloud an example poem that is prewritten for students to reference. Use shared writing to create a classroom poem. Intermediate:Have students turn and talk to a partner to share what they think should go in each section of the classroom poem. 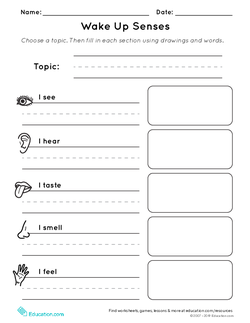 Hand out and preview the Wake Up Senses worksheet for students to complete independently. Circulate around the room offering support with idea generation and invented spelling. Have a small group of students work together to create a five senses poem about a specific object or animal in the spring (bee, flower, etc.). Provide a visual representation of the object or animal students will be writing a poem about. Intermediate:Provide a classroom word bank of sensory words for students to utilize as they write their poems. Have students struggling with writing focus on creating a detailed drawing for each of the senses. Bring in actual items for students to touch, smell, taste, hear, and see (such as flowers, leaves, honey, and caterpillars). Encourage students to use adjectives when they are writing their poems. Provide students with lined paper or writing journals and have them write using complete sentences. For example, "I see ____In the spring." Distribute whiteboards to each student. Tell students that they will practise using invented spelling to write items from each other's spring senses poems. Ask for a volunteer to name one of the items from their poem. Model for the students how to stretch out the word, isolate the sounds, and write down the letters that they hear on their whiteboards. Continue calling on volunteers to name items from their poems. Ask students to independently use invented spelling to write the name of this item on their whiteboards. Ask students to hold up their whiteboards after writing so that you can check their use of invented spelling. Provide alphabet charts for students to utilize as they practise their invented spelling. Assess if students are able to accurately identify and represent the letter sounds in their words. Intermediate:Have the class work together to stretch out the sounds in additional words prior to having students complete a word independently. Call students to the rug for author’s chair (a sharing technique where students sit in a chair before the group to share their story). Using either popsicle sticks to pull students’ names or by taking volunteers, give at least five students the opportunity to share their poems aloud. After each student is done reading, encourage other students to provide positive feedback by raising their hands to share something that they liked. Beginning:Have students share their poem with one other student in a turn and talk fashion. Intermediate:Provide a model for giving feedback. Post sentence starters for students to use when they are giving their peers feedback. Spring is here! You can feel it, hear it, smell it, taste it, and see it! In this spring lesson plan, students will create a spring poem using their five senses. Give him the challenge of filling in the correct words in this poem about firemen. Fill in the blanks with the rhyming words to make this poem not only sound great, but make sense too. Use the rhyming words provided in the word bank to finish this poem about Henry's trip to the zoo. This worksheet explains to kids what an acrostic poem is, and then challenges them to write an acrostic poem that describes each word provided. This activity allows your kindergartener to translate what he observes around him into a beautiful poem. Develop his writing skills and his creativity.